The NFL has been around for nearly a century now, and has been providing Americans with sports entertainment ever since. Who doesn’t love Sunday afternoon football? Whether you are a fan of the Cowboys, Giants, Saints or another NFL team, you are sure to get your fair share of entertainment during football season- thanks to the NFL. Aside from quality entertainment and sports fun, they also offer their NFL Extra Points card for rewards tailored specifically for sports fans. This day and age, everyone has at least ﻿one credit card of some type. The NFL knows that sports fans may need a little credit from time to time as well (especially on game day). With that in mind, they introduced a card that offers rewards for the sports fans. Let’s take a look at these rewards. First of all, they offer NFL points that can be used toward purchases at the NFLshop.com and many other places. Earn 1 point for every $1 you spend on the card, with 2X the points when you buy NFL and team purchases, even in stadium. Redeem your points for exclusive NFL experiences, game tickets, NFLshop.com gift cards or even cash back! Other than racking up points, you can also get 20% off at NFLshop.com and exclusive NFL experiences. Have you ever wanted to get out on the field? What about go behind the scenes in the locker room? Get these reward experiences and much more with the NFL Extra Points card. Sure, this is a great rewards card, but are there other benefits that come along with the card as well? There sure are! For instance, you will be protected with a zero liability when it comes to unauthorized fraudulent transactions. When you use the card, you also have purchase security each time you swipe it (or use it online or over the phone). They also offer travel benefits, including lost luggage reimbursement and 24/7 concierge services for their cardholders. This card may seem like a sports fan’s dream come true, but let’s take a look and see how the rates and fees measure up before we give our recommendation on it. 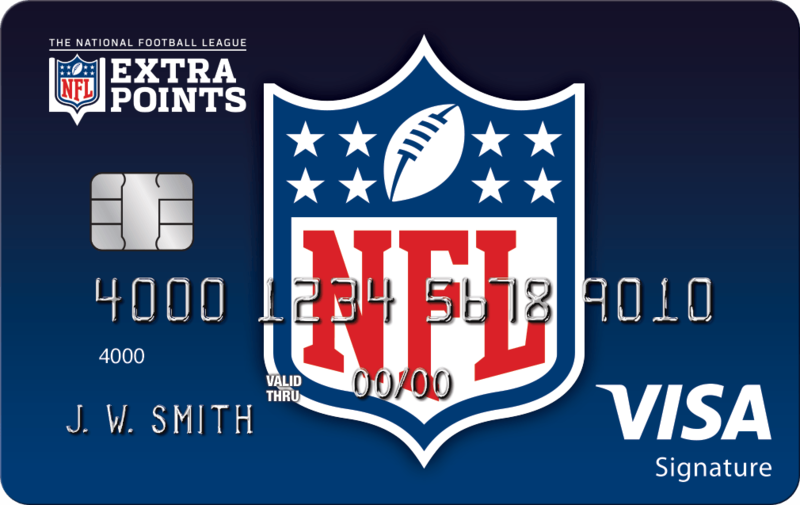 The NFL Extra Points card has a variable APR, depending on your credit history. Your APR will be either 15.24%, 20.24% or 25.24% based on the market prime rates. If you use the card for qualifying NFL ticket purchases, however, there is a 0% promotional APR for the first six billing cycles after the purchase date. This is great news for fans that like to see their games live. They also have a 0% introductory APR for any balance transfers that originate within the first 60 days of opening your account. After that, the rate will go to the standard annual percentage rate. Cash advances hold a bit higher APR, at 25.49%. To avoid paying any interest whatsoever on any purchases, just make sure that you pay your balance in full by the due date printed on your bill each month. All in all, it seems the APR for this card is pretty standard in comparison to other cards. Oh, and there is no penalty APR, so you don’t have to worry about your rate going through the roof if you miss a payment. All credit cards also come with some sort of fees. (They have to get their money somehow.) The good news is that the NFL Extra Points card doesn’t have an annual fee. The only types of fees they charge are transaction fees and penalty fees. Transaction fees will apply with certain types of transactions. For instance, the balance transfer fee is either 3% or $5, while the cash advance fee is either 5% or $10. Foreign transactions also have a fee along with them of 3% of the total transaction. As far as penalty fees go, you will see these fees on your bill if you make a late payment or have a check that is returned for insufficient funds. This fee can be up to $37, depending on where you live. While the NFL Extra Points card isn’t going to be the best card for everyone, it does seem like it has a lot to offer sports fanatics. If you want to earn points towards ticket purchases and other NFL experiences, it may be the card for you. With no annual fee, you get the rewards without having to pay a membership fee. This is probably one perk that really draws in consumers.